Ionian islands of Greece, Lefkada island. Hotel reservations. Vacation in the most enchanting Greek islands. Area 303 sq.km - Coastline 117 km. To get to Lefkada, you don't need to take a boat. Instead you go by car or bus, quickly crossing over the narrow channel separating the coast of Aitoloakarnania and the island. It is said that once upon a time Lefkada was united with mainland Greece. Some say the Leleges, its first inhabitants, transformed it into an island; others maintain that the Corinthians dug a trench across the isthmus. Lefkada is a mountainous island, covered with dense vegetation to the east and south. Its eastern coast slopes gently down to the sea, which is sheltered from the wind and dotted with thickly wooded islets. The most famous of these are Skorpios, Madouri and Sparti. ?n contrast, the west coast is steep, with a few stunted pine trees and lined with spectacular stretches af endless galden beach. The capital of the island is also called Lefkada. ? tranquil, picturesque town built ?n a natural harbour, it is composed of distinctive, multicoloured wooden houses, whose upper floors are covered with sheet metal. It is from here you'll set off - over good roads - to explore the island. Before abandoning the town, you may wish to visit the castle of Santa Maura, right next to the channel. 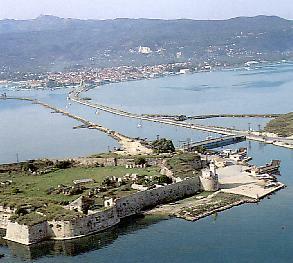 It was founded in 1300 by John Orsini, a Frankish knight who held Lefkada as a fief. If you follow the eastern coast road, passing through villages bordered on one side by the sea and on the other by lush greenery - villages like Ligia and Nikiana - you will come to Nidri, one of the most popular holiday spots on the island. 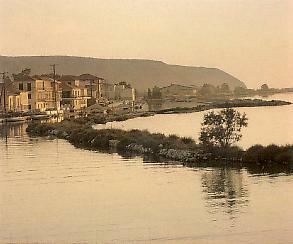 Nidri was the home of the German archaeologist, Dorpfeld, who maintained that Lefkada was in fact none other than Homer's Ithaki. Sights worth seeing in the area are the ruins of the prehistoric city and some circular graves. Your next stop on your way around the Island is Poros and the lovely pebbled beach of Mikro Yialo. 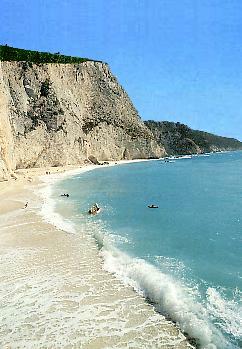 Vassiliki is Lefkada's southernmost seaside settlement. Here you can swim from the village's long, flat beach or hop aboard a caique that will take you in 30 minutes to Cape Lefkata. At Letkata or Sappho's Leap, the most sourherly cape on the island, there once stood a shrine to ??? ?l?, famous throughout the ancient world. Here, too, they say that the poet Sappho took her life, flinging herself from the white cliffs, a hopeless victim of her unrequited love for Phaona. Your tour of the island finishes with a visit to Agios Nikitas, a traditional, picturesque fishing hamlet on the west coast of Lefkada, and a stop at the island village of Karia, known for its handmade traditional embroideries. Both before and after Agios Nikitas you can take a dip in the sparkling waters of one of the most beautifui beaches of Lefkada. Its fine white sand stretches as far as the eye can see. 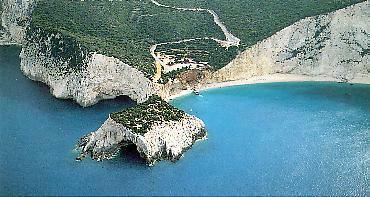 From Nidri, you can take a short ferryboat ride to Meganissi, 12 nautical miles southeast of Lefkada. According to historians, Meganissi has been settled s?nce Homer's time. It has three viliages, sea caves, wonderful beaches and clean waters.